Please note that this item is discontinued and no longer available for sale. Don't take on a kitchen or bathroom remodel without making sure there's a pair of these simple, affordable Tile Cutting Pliers in your toolbox. 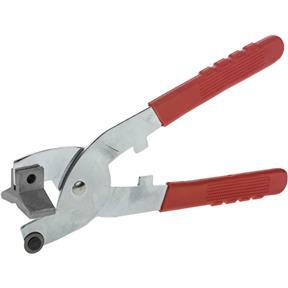 These commercial-quality pliers turn tile cutting into a simple, two-step process. First, score the tile with the built-in, free rolling scoring wheel. Then place the tile between the steel lower jaw and hard plastic upper jaw and apply pressure along the contoured plastic grips. Built-in stops ensure that you'll apply just the right amount of pressure for dependable results. Pliers measure 8-1/2" overall.